Near our home in Echterdingen, a few S-Bahn stops from Stuttgart, is what's called Siebenmühlental, or seven mills. Below is a map showing the route. 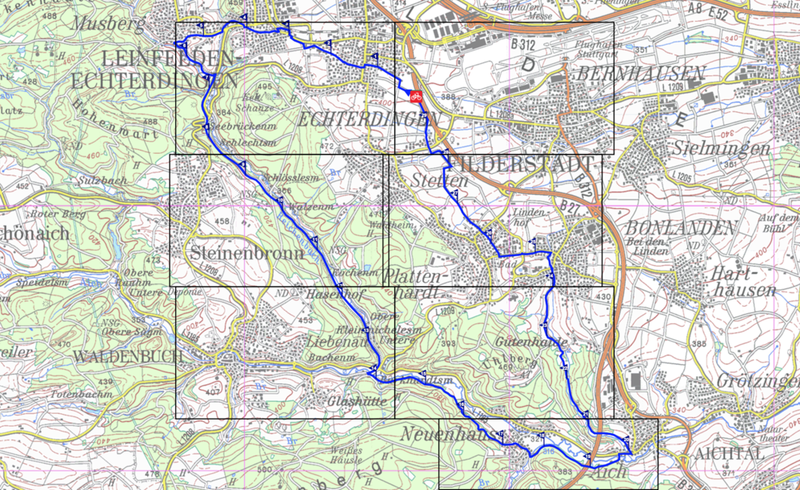 It's not so easy to read, but you can see that you go from Leinfelden to Echterdingen, down near Aichtal, then around to Steinenbronn and back. If you visit the VVS Radroutenplaner website you can completely map out your bike route. There are seven of these biergartens and all can be reached within a day on your bike. The trail has some hills but is paved for the most part. It is a beautiful ride through the woods and a nice escape from the city. It's personally one of my favorite places in the area. - Eselmühle is in an idyllic setting with rolling hills, a small animal farm (with rides for the kids), a donkey mill that still works, and a small store with organic produce and knick knacks. - All of the biergartens have a food selection with local specialties. - Aside from beer, you can also order wine, spirits, soda, apfelschorle, and more. - Biergartens are kid friendly and a few even have playgrounds within earshot of the tables. - When you order a drink you are charged a pfand, or deposit, that you get once you return your glass. - Many of these biergartens are seasonal and only open from May to September. A few stay open year round. - Some of the mills have events throughout the year such as live music. Schlosslesmühle, a former post office between Stuttgart and Tübingen, has live karaoke music on the weekends in the summer. - Although not officially on the mill trail map, the Waldheim Stuben is closest to Echterdingen and has a large playground for kids. Another biergarten along the way (and closest to Waldenbuch) is Waldmeister Biergarten. This one is large and has a nice parking area to start from. - Echterdingen is where the airport is located so it's quite easy to get to if you're only here for a few days. - To my knowledge there are not any bike rentals nearby. There are signs along the way to let you know you are in the right place! If you are taking the train, the S-Bahn in Leinfelden is the closest. Echterdingen is a little bit longer of a bike ride. In both cases you'll have to ride through part of town to get to the first biergarten. From Leinfelden the closest one is Eselmühle. Waldmeister Biergarten, near Waldenbuch, is another good starting point. Click here for the official website and full listing of mills.